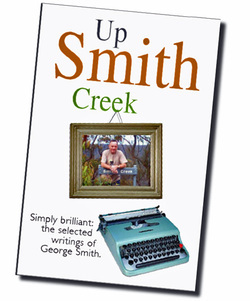 I am currently reading an enjoyable book called “Up Smith Creek”. The book is a collection of articles written by the late George Smith in his one of his capacities as a columnist for various publications (he was a busy man and first-class penmanship was only one aspect of his illustrious career). The book came highly recommended by another marketing guru, Drayton Bird and that was enough for me to set about buying my own copy. Within hours of Drayton’s note, I bought mine directly from the publishers, White Lion Press, after a pleasurable exchange of emails with the managing director, Ken Burnett. So far, I have dipped in an out of the book (and it is conducive to this kind of treatment), reading a handful of articles per sitting, but once I have finished imbibing USC, I will contemplate writing a more detailed review. I hesitate slightly though because I acknowledge my own literary shortcomings and, this is being brutally honest, you’ll get far more pleasure reading George’s narrative than my own. For the time being though you should know that George Smith was an excellent scribe and I recommend you seek his work out too. His writings evidence a wonderful grasp of the English language and his vocabulary is broad and shows richness and a humour that, frankly, I have found inspiring. As a result of reading his material, I have realised that I will just have to try harder when scribbling my own!